Oh hey, happy Sunday! I felt like making an extra post today since so much has happened since the skating lesson of yore. For one thing, I decided I need to buy my own skates sooner rather than later so I can get to practicing every day. I’m not prepared to spend $300 to buy all my basics brand new, so yesterday my mother-in-law (Chuqui!) and I decided to check out the local sports consignment shop. 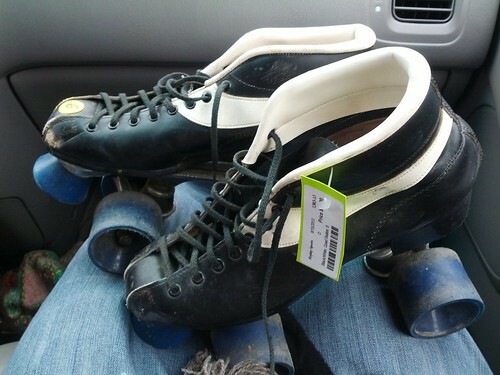 There for $10, I bought a pair of pre-loved skates with wheels that had clearly made a lot of left turns already. They were so uneven they were completely un-usable, but I tried anyway. Our house is at the bottom of a long, shallow incline, so I figured it’d be a nice challenge to skate up and a decent coast down. Turns out, the slope’s a lot more intimidating when you have wheels strapped to your feet and one skate keeps pulling to the left. I made it to the top but didn’t dare go back down. Out of fear that I would kill myself or damage someone’s car, I took a seat on the curb, removed the skates and my socks, and walked back down the hill barefooted. It was a small defeat, but I took a shower and got ready to go out because Jenn and I had plans to see a bout between Baltimore’s Junkyard Dolls and DC’s Majority Whips. Baltimore pretty much trounced DC, but both teams were amazing. We bought VIP tickets for the floor seating, so we had a great view of what was going on. When we sat far away before, it was easy to see how awesome the jammers were, but when you’re up close and see the work the blockers are putting in, the sport takes on a whole new quality. Between bouts, we talked to the women from Department of Skate, who said they’d be happy to take a look at my skates and help me replace the wheels and stuff. And that, my friends, is where I’m headed off to, now. 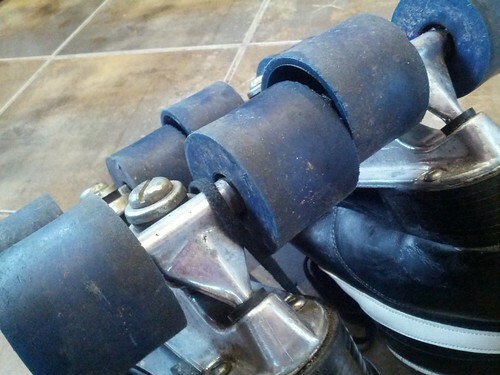 Hopefully the next time I give you a derby update, it’ll be about how awesome my newly wheeled skates are!